Turns out Chinese tech upstart Xiaomi makes a heck of a lot more than its signature, low-cost smartphones. Founded just five years ago, the Beijing-based firm has already done battle with Samsung and Apple for the top spot in China's cutthroat smartphone market. 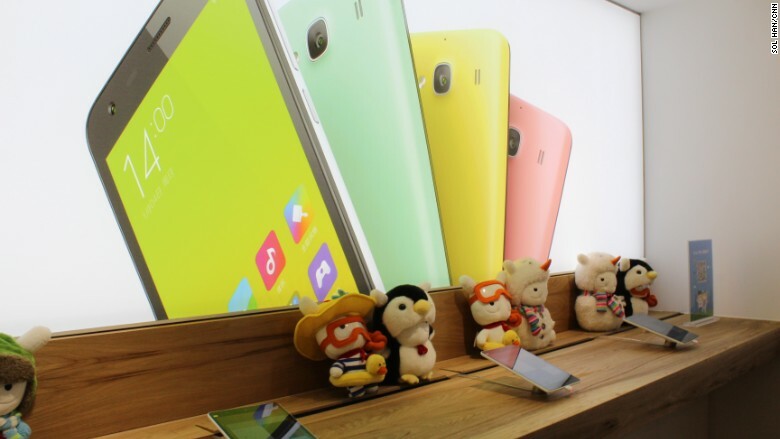 Along the way, Xiaomi has cultivated a rabid fanbase known for its unyielding devotion. Some "Mi fans" get together to sing songs about the company, while others even shave the brand's logo into their hair. Now, Xiaomi is going global, and the company is hoping to attract legions of new fans with a suite of products ranging from fitness trackers to GoPro-style cameras. It's also dabbling in retail, starting with a new concept store in Hong Kong called "Mi Home," the first of its kind outside mainland China. 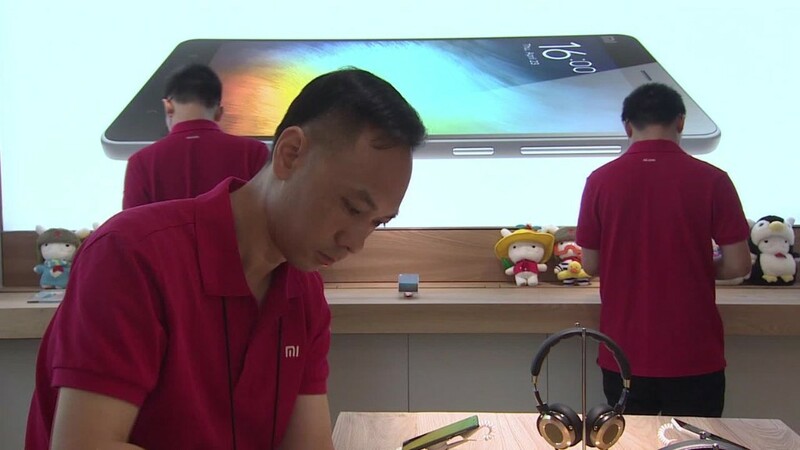 "Xiaomi 'Mi Home' is really a customer experience store," said Zhang Jian Hui, a manager at Xiaomi. "It has three main purposes -- the first is to showcase all our new products, second is our after-sales, one-stop shop, and third is that it's a place for fans to mingle." Customers walking through the doors get a big, warm welcome -- some even get pulled aside by sales staff to take selfies. 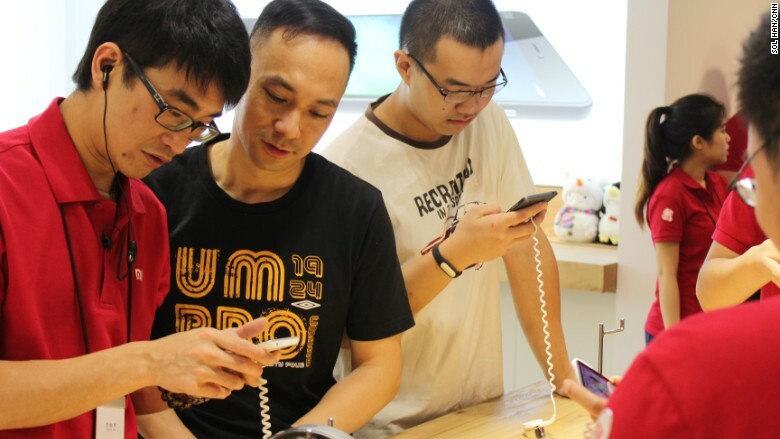 Xiaomi sales staff show customers the company's smartphone offerings. The shop, located on the 20th floor of an industrial building in Hong Kong, is dotted with plush versions of the oddly adorable Mi Bunny, and the shelves are stacked with photos of Xiaomi employees. In the back of the store, customers can browse the company's smartphones, tablets and phone accessories. Phone covers go for a few bucks while tablets sell for around $200. Shoppers looking to take home Xiaomi items will be disappointed to learn that many of their flagship offerings aren't yet available outside mainland China. The priority of "Mi Home" remains customer service, not retail sales, Zhang said. In general, the company still encourages people to buy online -- Xiaomi has always largely relied on word of mouth and web sales, a tactic that helps keeps costs low. Xiaomi already operates 19 "Mi Home" locations inside China, and plans to open one in Taiwan this July. In Hong Kong, the newest "Mi Home" is already attracting customers from around the world. "I saw their post on Facebook ... [and] we were just at a shopping mall two blocks away," said Pascal Ming, from Switzerland, who was in Hong Kong for his honeymoon. "Xiaomi is a rising brand in the Asia region, but not yet in Europe -- we don't have these products [so] I just wanted to see them, touch them." Xiaomi's plush "Mi Bunny" dots the Hong Kong store. Earlier this year, Xiaomi set a Guinness World Record for the most mobile phones sold in a 24-hour period. The company made a whopping 2.08 billion yuan ($335 million) during its annual "Mi Fan Fest" promotion, selling 2.12 million smartphones, 770,000 smart appliances, 247,000 power strips, 208,000 fitness watches, 79,000 wi-fi units and 38,600 smart televisions, according to its official Twitter account. Xiaomi has been called the Apple of China -- it's smartphones feel similar to iPhones, "Mi Home" looks like an Apple store, and its CEO Lei Jun even dons black turtlenecks and blue jeans during some events, similar to what Steve Jobs often wore for Apple product launches. Mi fans in America can purchase various accessories such as headphones and portable gadget chargers on Xiaomi's online U.S. store, which launched earlier this month. No smartphones are available -- yet. - CNN's Jonathan Stayton contributed to this report.